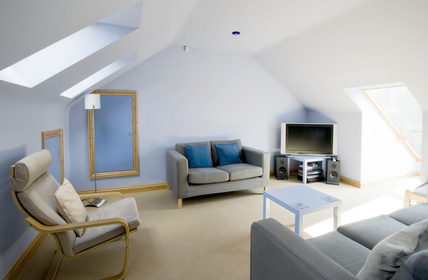 Are Loft Conversions Still Worthwhile? Home extensions in general, and loft conversions in particular, have been growing in popularity for many years. Since 2006, when I first built this website, converting the loft has been the most popular home improvement project and also the one that yielded the homeowner the biggest return in terms of value added to the property. Since 2005 we have seen the housing market rise and fall, the economy boom and then spiral into double dip recession, banks fail and successive governments wrestle with trying to balance the countries books. Throughout all that creating more space in a home by converting the loft into one or two new rooms has always kept builders and homeowners busy. But, to return to the question posed in the title, are loft conversions still worthwhile at the present time here in 2013? The short answer is yes, very much so. In fact now is probably a great time to finally convert the loft. Let me explain. For many years it has been recognised that by building into the roof space the homeowner can add plenty of value to their property (click here for much more information) and that is even more true today. The property market is showing signs of growth with house prices rising and adding an extra room or two to your property will add tremendous value to your home. The value to your home can be increased even more now because the construction industry, at least the small end of it, is still struggling. That means more builders are competing for projects and are cutting their profit margins to win contracts. That, in turn, means lower prices for the homeowner who is looking to begin a loft conversion project. With builders keen to secure work and happy(ish) to cut their prices, it is very much a buyers market at the moment. This, of course, gives the homeowner looking to carry out a loft conversion, lots of leverage when it comes to negotiating prices. By looking around and inviting at least three builders to submit tenders the property owner should be able to secure keen quotes. By the way, make sure each builder knows that you are obtaining other quotes, this will encourage them to be competitive with their estimates. With builders fighting each other for work (hopefully not literally) the homeowner should be able to save significantly on what a project would have cost a few years ago. However, there is a big caveat here. Having said all the above about it been a great time to get low quotes – do not select a builder on price alone. No matter what the quote, and how big a bargain it seems, do not be in a rush to sign anything. Do your due diligence first. Always ask for references and check them out personally, make sure the builder and his work is insured, do not make big payments upfront and be aware that if something seems to be too good to be true then it usually is. Be very careful when choosing a builder. See this article for more information on getting the right builder for your loft conversion.